Fried prawn rolls, or Hei Zho, is a very popular dish at Zichar stalls. 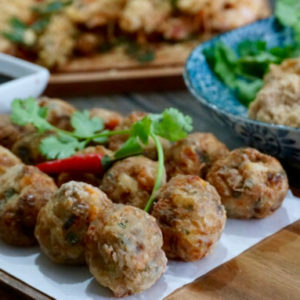 It is very similiar to Ngor Hiang except that it contains more prawn than meat and it is usually tie up into segments, resembling a chain of beads, whereas Ngoh Hiang resembles sausage. 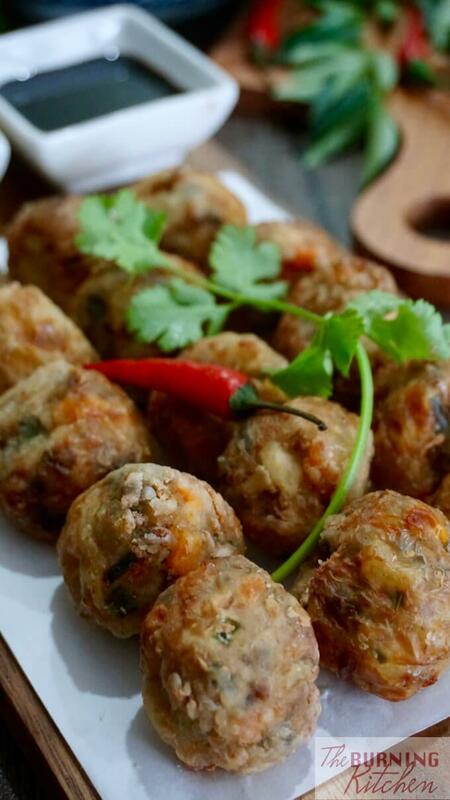 That’s why Hei Zho is sometimes known as Fried Prawn Balls, while Ngoh Hiang is also known as Spiced Sausage. When I was living in Thailand, I was surprised to find that Hei Zho is also a ‘must have’ dish in any Thai Teochew restaurants. Their Hei Zho has lots of crab meat in it, which gives it a somewhat different and delicious taste and texture. I really enjoyed the Thai sweet chilli dip that Hei Zho is usually served with in Thailand, so I have included this as an additional dipping sauce with the usual sweet sauce commonly used. There’s more prawns than ngor hiang in Hei Zho, which means that the texture is more springy! 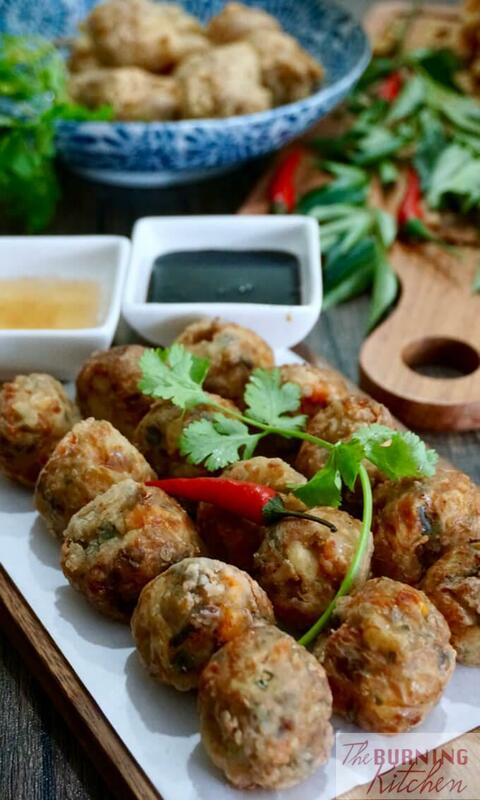 The Thai version has crab meat, boosting the seafood flavour of the dish. Thai sweet chilli compliments well with the savouriness of the fried hei zho! HOW TO MAKE HEI ZHO? Remove the shell and vein from the prawn. Wash and pat dry. Add 1/2 tsp sugar and a pinch of salt to the prawns and set aside for about 15 minutes. Then cut each prawn into 4-5 pieces. Wash the pork and pat dry. Cut the pork into smaller pieces and chop it with a cleaver or use a mincer to mince it but not too fine. Remove the skin from the carrot and cut into small cubes. Use a brush to clean the mud from the water chestnuts. Then remove the skin and cut the water chestnuts into small cubes. Wash the spring onion and cut into small pieces. Remove the skin from the shallots and slice it finely. Wash the cucumber and slice it thinly and put in a bowl of ice cold water. Leave in the fridge for garnishing later. Wash the parsley and cut it into 3 cm lengthwise and put in the fridge for garnishing. In a big bowl add in the prawns, minced meat, and other Hei Zho filling ingredients. Mix well with your hands, then slap the prawn mixture a few times into the bowl until it is sticky. Cover it with cling wrap and leave it in the fridge for 1 hour. Meanwhile, use a damp cloth to wipe the dried bean sheet to remove the salt. Then cut each sheet into 4 long pieces of equal size by folding it into half and another half lengthwise and cutting along the folded line. Scoop 4-5 tbsp of the prawn mixture on the bean curd sheet to fill the whole length leaving a gap of 3 cm space at both ends. Roll it tightly. Using some of the prawns mixture and run it along the open edge of the bean curd sheet to seal it. Repeat the process until all the prawn mixture is finished. Each roll should be about 4-5 cm in diameter. Starting at the centre and working outwards, use butcher’s twine to tie a series of loose knots around the roll to form a chain of beads. Cut off the excess twine. The knots should be about 5 cm apart. Finally tie a tight knot at the both ends. Place the prawn rolls on an oiled stainless plate leaving a gap between the rolls. Mix the cornflour and rice flour together on a plate and set aside for later use. In a wok, add in water and bring to a boil. Once boiling, place the prawn roll on the rack and steam for about 15 mins. Meanwhile, prepare the Chilli Dipping Sauce. Let them cool completely first before removing from the plate otherwise they stick to the bottom of the plate and the skin will break easily. Cut the roll along the knotted section and remove the twine. Then coat the cut prawn rolls with the flour mixture. In a wok, heat up 3-4 cups of oil over high heat. Once the oil is heated up, lower the heat to medium. Shake off the excess flour from the prawn roll and slowly lower them into the oil. Fry until golden brown, turning them using a pair of long kitchen tongs to ensure even cooking. Place the prawn roll onto a plate lined with kitchen towel to drain off the excess oil. Garnish with parsley and cucumber. 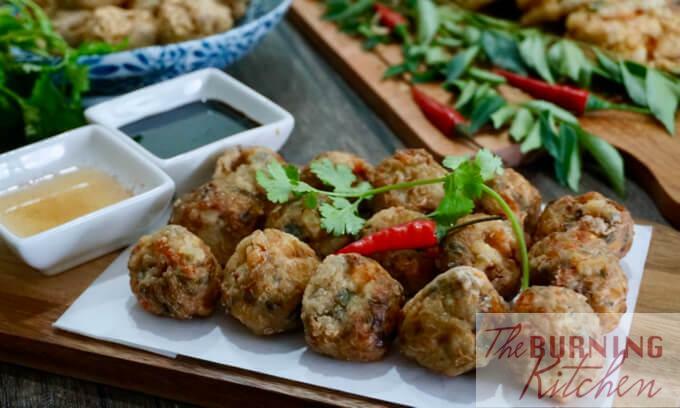 Best serve with black sweet sauce and Thai chilli dipping sauce while they are piping hot. Wash and cut the cucumber in half and remove the centre core. Cut the cucumber into tiny cubes. Pour the Thai chilli sauce into a bowl. Add in all the other ingredients to enhance the sauce for dipping. Do not mince the prawn. It is better to cut it into pieces so you will still be able to taste the flavour and texture of the prawn. Do not overmince the pork until it become mushy and powdery. Do not smash the water chestnut. Simply cut it into small cubes to retain its crunchiness. Slap the prawn mixture onto the bowl to help firm it up by binding the ingredients together. Leave the prawn mixture in the fridge to make it firmer and easier to handle. Put the cucumber in ice cold water to make it very crunchy and more refreshing to go along with the deep-fried hei zho. Scoop out one teaspoon of the prawn mixture onto a sauce plate and microwave for a 15 seconds to taste it first and adjust the seasoning accordingly before rolling it, which I always do. Use a damp cloth to clean the bean curd sheet on both sides as it is coated with a layer of salt for preservation purposes otherwise it will be super salty and your effort will be wasted. While cleaning, be very gentle as the sheet breaks easily. Cleaning it with a damp cloth also helps to soften the sheet so that it is not so brittle and easier to roll. Ensure the prawn mixture is rolled in tightly so that there are no air gaps between the prawn mixture and the sheet. Air bubbles may cause the bean curd skin to balloon and burst during frying, and the filling will fall out. Do not tie the roll too tightly or it will breaks. Just simply squeeze the roll to create a waist then tie the knot. leave a gap between the rolls when steaming or they will stick to one another during steaming and it will be difficult to separate them without breaking the skin. Oil the steaming plate before putting the roll in or the skin will get stuck and break when removing it. Alternatively, you can place a banana leaf on the rack to prevent the skin from sticking to the rack. Make sure the oil is not extremely hot when placing the roll into it as the bean curd skin will get burnt easily. It is best is to test the heat by placing one prawn roll in first, and then adjust the heat accordingly. There is no need to fry prawn roll over too high heat. The prawn roll is already cooked so the purpose of deep frying it to give it a nice golden brown colour and crisp. After steaming, store some of the prawn rolls in the freezer if you wish. You can take it out anytime to fry, or simply make this ahead for a party. Gluten-Free: Ensure you use gluten free condiments. Deep Fried Prawn Roll, or Hei Zho, is a Teochew and Hokkien favourite dish served during Chinese New Year. 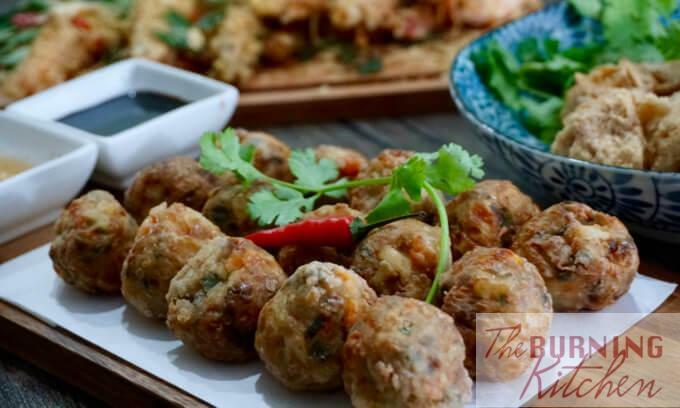 Similar to Ngor Hiang, this dish contains more prawn and is in the shape of beads. Eat this while it's hot! Starting at the centre and working outwards, use butcher's twine to tie a series of loose knots around the roll to form a chain of beads. Cut off the excess twine. The knots should be about 5 cm apart. Finally tie a tight knot at the both ends.